In this culture, and others, we value confidence in leaders, mechanics, doctors, generals, and even strangers we've asked for directions. But in all these cases, and more, we're actually seeking expertise, knowledge, and capability — in short, competence. 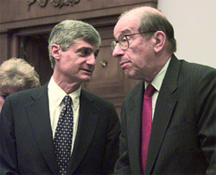 U.S. Secretary of the Treasury Robert Rubin (left) with Federal Reserve Board Chairman Alan Greenspan in discussion before meeting with the House Banking Committee on 20 May 1999, just six months before the work of Kruger and Dunning appeared. They were then both at the height of their power, which both used liberally to resist calls for regulation of new and growing sectors of the financial markets — the very sectors that contributed so much to the financial crisis at the end of 2008. Both men were studies in confidence, and that confidence played a role in persuading officials and the population at large that the U.S. economy was healthy and on course. Yet, on 23 October 2008, under questioning by Rep. Henry Waxman, chair of the Committee on Oversight and Government Reform of the U.S. House of Representatives, former Chairman Greenspan testified, with regard to his "conceptual framework with the way people deal with reality," that, "…I found a flaw, I don't know how significant or permanent it is, but I have been very distressed by that fact." He went on, "I found a flaw in the model that I perceived is the critical functioning structure that defines how the world works…I was shocked." One model of what might have happened to him is that he had discovered the limits of his competence. The fourth factor observed by Dunning and Kruger states that, "Incompetent individuals can gain insight about their shortcomings, but this comes (paradoxically) by gaining competence." If this model applies, one might conclude that by October, 2008, Mr. Greenspan was somewhat more competent than he had been in 1999. Read Mr. Greenspan's complete testimony and view other documents related to the hearing. Photo courtesy U.S. Department of the Treasury. We usually assume that confidence comes from competence. We apply this assumption personally when we seek health care, investment advice, or other services. But we also apply it at work — when we make hiring decisions, when we evaluate the assertions of superiors and subordinates, and when we get advice from consultants. Trouble is, the assumption is wrong. Incompetent individuals, compared with their more competent peers, dramatically overestimate their ability and performance. Incompetent individuals are less able than their more competent peers to recognize competence when they see it. Incompetent individuals are less able than their more competent peers to gain insight into their true level of performance. Incompetent individuals can gain insight about their shortcomings, but this comes (paradoxically) by gaining competence. Taken together, these four factors contribute to an inverse correlation between confidence and competence — exactly the opposite of what most of us assume. If we can't rely on confidence as an indicator of competence, on what can we rely? In assessing competence, when we do consider factors beyond confidence, we tend to focus on domain-specific content. That helps, but it's not enough. Here are four generic indicators of competence for application in the workplace. The truly competent understand that their competence is limited — that there are things they can't do or don't know. This knowledge drives a continued desire to learn. Curiosity, practice, questioning, and continued study are signs of a drive to enhance competence. It is this drive that established the existing level of competence. Where this drive is weak, competence is questionable. ability and performancefailure in constructive ways is another important way to build competence. This ability is probably essential to building competence. Realistic risk assessment requires a reservoir of experience — competence — in the relevant domains. Incompetence leads to mis-assessment of risk. The fearful and incompetent tend to overestimate risks; the brash and incompetent tend to underestimate them. Competence tempers both. For more about the Dunning-Kruger Effect, see "How to Reject Expert Opinion: II," Point Lookout for January 4, 2012; "Devious Political Tactics: More from the Field Manual," Point Lookout for August 29, 2012; "Overconfidence at Work," Point Lookout for April 15, 2015; "Wishful Thinking and Perception: II," Point Lookout for November 4, 2015; "Wishful Significance: II," Point Lookout for December 23, 2015; "Cognitive Biases and Influence: I," Point Lookout for July 6, 2016; and "The Paradox of Carefully Chosen Words," Point Lookout for November 16, 2016. Would you like to see your comments posted here? rbrensPNqzriJjpqISwADner@ChacGvHVScqqpsNpUzuZoCanyon.comSend me your comments by email, or by Web form. See also Personal, Team, and Organizational Effectiveness, Critical Thinking at Work and Cognitive Biases at Work for more related articles. I offer email and telephone coaching at both corporate and individual rates. Contact Rick for details at rbrenPMFBlHFvogJbwaGDner@ChacCSRLklUhbFxowlKUoCanyon.com or (650) 787-6475, or toll-free in the continental US at (866) 378-5470.